Experts in U.S.-China relations gathered for a panel discussion reflecting on the 40th anniversary of U.S.-China normalization and examining various key aspects of the relations, past and present. The USCPF president, Professor Chi Wang, was recently recognized by Senator James Risch, Chairman of the Senate Foreign Relations Committee, and featured in the Congressional Record. The U.S.-China Policy Foundation is excited to announce that our 23rd Annual Gala Dinner will be held on December 5 at the Mayflower Hotel in Washington, DC. Tickets and sponsorship options are now available. 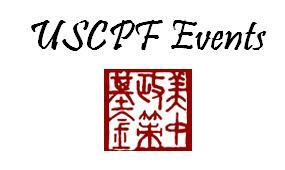 On Wednesday, September 5, USCPF hosted a welcome luncheon for Hong Kong Economic Trade Office (HKETO) Commissioner Eddie Mak. In July 2018, Mr. Mak assumed the post of Hong Kong Commissioner for Economic and Trade Affairs, USA. The U.S.-China Policy Foundation led a MECEA educational congressional staff delegation to Beijing, Tianjin, and Ningxia during the August recess. The trip highlighted China’s agriculture, development, and minority regions. The recent trade disputes also received significant attention during discussions with officials. This exhibit featured Chinese paintings by Wang Peng and calligraphy by Wang Chi. While one brother pursued painting and the other pursued calligraphy, they both shared a love for Chinese art. This shared passion kept the brothers close over the years. USCPF hosted a farewell luncheon for Hong Kong Economic Trade Office (HKETO) Commissioner Clement Leung. Appointed in 2014, Mr. Leung served as Hong Kong’s most senior official in the U.S. for four years. An exhibit of photos and posters depicting China’s Cultural Revolution (1966-1976) will be on display along with background information about this tumultuous period in China’s history. During the spring congressional recess, the U.S.-China Policy Foundation led a congressional staff delegation to Beijing, Shanghai, Suzhou, and Zhuhai. The trip highlighted China’s transportation, infrastructure, and development projects, especially those mentioned by President Xi Jinping in his New Year speech. On March 20, USCPF’s President, Professor Chi Wang, recognized his long relationship with The Council on East Asian Libraries (CEAL) by hosting an appreciation dinner held during the CEAL conference in Washington, DC. USCPF President, Chi Wang, gave a lecture to a visiting delegation of Chinese representatives as part of the U.S. State Department’s International Visitor Leadership Program through the Institute of International Education.